The sudden disappearance of honey bees in many parts of the country might be related to pesticide exposure, according to Washington State University entomologist Walter (Steve) Sheppard. Beekeepers have struggled as hives have failed soon after the bees embark on their pollen-gathering season. In what has become known as “colony collapse disorder,” honey bees leave the hive and don’t return. “I don’t think we really know what we’re up against with colony collapse disorder,” said Sheppard. This summer, his research team is exploring the possibility that exposure to pesticides in the hives is contributing to colony collapse. For the past decade, beekeepers have treated their hives with pesticides to combat two kinds of mites that parasitize the bees. Honey bees rear their young in waxy honeycomb which is re-used for several years. If pesticides used to control mites build up in the wax, over time they could reach a concentration at which they harm the bees as well. Sheppard is testing whether something in the honeycomb of a failed colony will carry over and affect the health of a new brood of honey bees. Honey bee health is crucial to the nation’s farmers and fruit growers, who rely on honey bees to pollinate crops such as apples, cranberries and watermelons. Together, honey bee pollinated crops are worth more than nine billion dollars a year to the American economy. Sheppard directs the Apis Molecular Systematics Laboratory at WSU. He was a member of the Honey Bee Genome Project, an international consortium of scientists that earlier this year published the complete DNA sequence of the honey bee, Apis mellifera. This project, in its final year, is funded with grants from the Northern New York Agricultural Development Program and New York Farm Viability Institute and the Cornell Agricultural Research Station. The project team will also provide conclusions about use of soil nitrogen tests to determine when corn grown in New York needs nitrogen. NEW YORK, June 15, 2007 – A new initiative from Columbia University Medical Center will be the first to target chronic oral health problems in sub-Saharan Africa, where the vast majority of chronic diseases are left undetected and untreated. The initiative is the result of an anonymous $1.5 million gift to support the Millennium Villages, which aims to fight extreme poverty and related challenges such as disease, hunger and lack of access to water and sanitation though scientifically sound and sustainable interventions. A third of the gift will be devoted to supporting the oral health program. Chronic diseases will soon become the leading cause of health problems in the developing world, and oral health conditions are one of the most common chronic disorders, according to the World Health Organization. Initial Columbia research in the village of Koraro, Ethiopia, found that more than half of the population complained of oral pain. The generous donation will fund the first extensive initiative, led by Columbia’s College of Dental Medicine, to directly target oral health problems in sub-Saharan Africa with a sustainable prevention and treatment program. The health component of the Millennium Villages grew out of the United Nations Millennium Project and the World Health Organization Commission on Macroeconomics and Health, both of which showed the direct link between improving public health and economic growth. Those reports explained that health improvements can only happen through a broad range of inter-related public health reforms. The Millennium Villages project, supported by The Earth Institute at Columbia University, Millennium Promise, the United Nations Development Programme, and the UN Millennium Project, currently includes 12 sites in 10 sub-Saharan countries. It reaches more than 400,000 people with plans to increase its reach over time. The project empowers the local health care sector by supporting basic health interventions, building or upgrading clinics, and expanding the pool of community or village health workers. The participating villages are integral partners in the project and take responsibility for the interventions. In addition to the oral health initiative, the new funding will support Columbia-led interventions to address chronic cardiovascular and mental health disorders in the region. 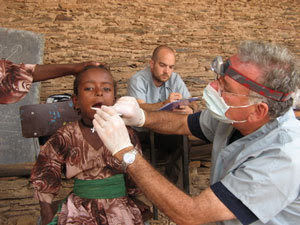 The dental component of the project is the result of research by Dr. Syrop and his team, who traveled to Koraro, Ethiopia, in the fall of 2006 to assess the oral health situation in the village of 5,100 people. In addition to the common complaint of oral pain, the team found a high incidence of hardened plaque (calculus) and gingival bleeding. Ninety-five percent of the people they examined had significant dental erosion because of the presence of sand in their food as a result of the arid environment and lack of water for rinsing crops. Teams of five or so Columbia faculty, staff and students will travel this fall to sub-Saharan countries, including Tanzania, Rwanda and Senegal, to collect data and assess the population’s oral health needs. They will use the data to develop a program for three or four villages initially, and then ultimately incorporate oral health as an integral component of improving health care at all of the Millennium Village sites. The Columbia teams will train local health care workers to provide basic essential dental care, including extractions and control of infections. Additionally, the teams will introduce a comprehensive prevention program in the schools and the overall community by working with local teachers to develop a curriculum that is appropriate and sustainable for the individual village. They also will develop a prevention program to educate mothers about caring for the oral health of their young children. Freedom? I don't think so. When I stepped onto my front porch this morning, I thought I was in Costa Rica. At 7 AM on most June mornings in Greensboro, North Carolina, it is already unsettlingly warm, a harbinger of the choking, sweltering afternoon to come. But this morning, the air was different. Cool, gray, moist. So humid it wasn’t even mist, really, so much as tiny droplets of rain suspended in midair. I breathed in the sickeningly sweet perfume of our privet’s tiny white blossoms, not unlike the cloying scent of the pink guavas that flavor Costa Rican air. I breathed, again, closing my eyes until the waves of nostalgia slackened enough for me to climb upon my bike and pedal down the sidewalk. As I crested the hill on Spring Garden Street, I was astonished to see the buildings of downtown completely obscured by an impenetrable curtain of gray. No number racing today. I usually like to use the clock atop the JP Morgan tower to time myself as I creep up the final ascent toward downtown, but this morning I couldn’t even tell the tower existed. I’d just have to pedal hard and hope for the best. As I circled the roundabout onto McGee, I caught a whiff of sizzling sausage in the air. Instantly, the Costa Rican neblina became a familiar English fog. I thought of the little sausage rolls my brother ate at a Tesco’s deli in York, eleven years ago. I breathed in deeply and now I was riding, not through Costa Rican jungle pathways, but down English high streets, the alleys behind our village’s bakery. Longing stirred again deep in my chest. But now was no time to dream. Elm Street, the main artery of downtown, means dodging streams of commuter cars, buses, trucks, pedestrians, and the occasional fellow biker. As I flew past a line of vehicles waiting impatiently at a light, I set my sights on a dump truck some four blocks ahead. “Prepare to meet your match, dumpy,” I whispered, and started pedaling like crazy. The dump truck got stuck at the next light, while I whizzed past a coffee shop, a bakery, a theater, a club. I zoomed over a cross walk, circumventing another motionless lane of traffic. Now I could hear the rumble of the dump truck’s engine. Perfect – now it had gotten stuck at the Smith Street intersection. I rode as hard as I could. As the light changed, as the dump truck shifted into gear, I shot through the intersection, surging into the lead. Grinning from ear to ear, I gloated as I screeched to a stop in the parking deck. The truck rumbled past. As I chained up my bike and pounded downstairs to the office, my face was glowing with heat, despite that cool, unearthly mist. 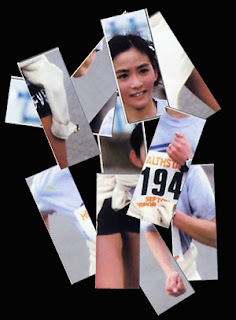 My heart was pounding, my leg muscles were alive and awake. As my sleepy co-workers shuffled into their cubicles, yawning and clutching cups of coffee, I tucked my bike helmet under my desk and smiled. Waiting for my boss to arrive, I sipped my tea and read the morning paper. “Drivers go it alone on way to workplace,” proclaimed a headline on page A3. Despite gas prices over $3 a gallon, the article told me, the percentage of commuters driving to work alone has reached an all-time high of 77%. “It’s very hard to find someone to ride with, and it’s very hard to find public transportation,” explains Alan Pisarski, author of Commuting in America. “There aren’t a lot of options for people.” Part of the problem, the article clarifies, is the housing and work patterns of most suburban commuters, and the few alternative options available in most areas. I set the paper down. Freedom? What had I experienced this morning, if not freedom? I’d been to two continents. I’d daydreamed, raced, dawdled, soared. Standard of living? This morning I’d gotten a jolt of free exercise, a boost of confidence and excitement; meanwhile the drivers I whizzed were stuck at stoplights, trapped in machines that greedily guzzle their gasoline, money, and time. It’s true that in some ways, relinquishing your car is losing the ultimate convenience: total mobility, at your whim, all the time. When I carpool out to our construction yard, it’s true that I am not free to leave the instant my work is done. I do have to wait until my co-workers are done, too, and I have to endure a longer ride home as we go by Catherine’s house and Jeremy’s apartment before mine. But in another light, I am more free: free from dependence on foreign oil, free from the burden of caring for a car, of earning money to upkeep its needs and feed its hungry gas tank. Free from the guilt of contributing to our nation’s insatiable, war-mongering need for more, more, more. Free from the responsibility of the realization that, in order to avert the energy crisis that we are on the brink of, some things have to change. Our definition of freedom, for instance. Our definition of what it means to live well. There is no good reason to deny insurers access to genetic information, argues a Professor of Ethics in a debate published in this week’s British Medical Journal. Only if we refuse to give insurers access to all health information can we reasonably stop them seeking genetic test results, says Professor Soren Holm from Cardiff Law School. If insurers were denied access to any health information they would only be able to differentiate premiums according to very general risk markers, for example, age, gender or occupation. This would mean in effect that the healthy subsidise the unhealthy – but there would be equality. Professor Holm concedes there are worries about sharing genetic information - allowing insurers to see genetic information could deter people from getting tested or insurers may use the information inappropriately. This may be the case, he says, but the same is true for other health information – for example whether someone is HIV positive. He argues a better solution to this problem would be to make challengeable a decision to deny coverage for life or health insurance, thereby forcing insurers to make their reasoning transparent. On the other side of the argument Professor Richard Ashcroft from the University of London says access to genetic information should not be allowed as it could lead to irrational discrimination. This arises, he says, from false beliefs about genetic information. It can be misunderstood or its significance over-estimated. In the face of uncertainty surrounding the interpretation of genetic information, occasional discriminatory practice by individual insurers and a lack of solutions to the problem of social justice, he says, it is preferable to maintain the status quo, at least in the medium term.